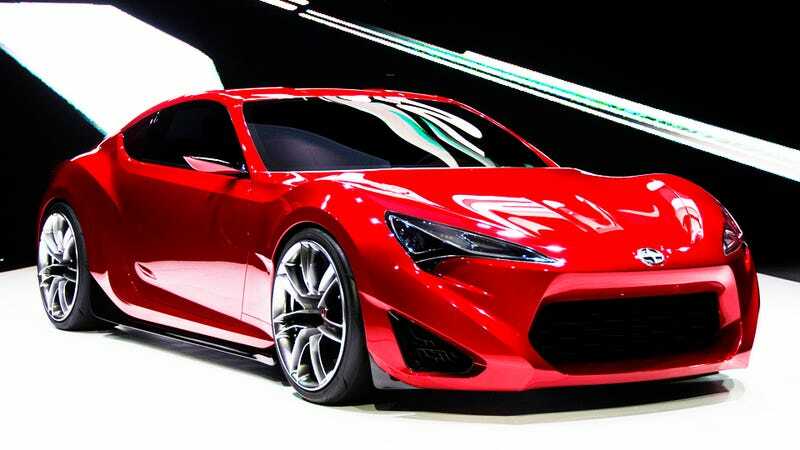 Our friends over at FT86Club got their hands on a Toyota FT-86 / Scion FR-S / Subaru BRZ training sheet and we finally have a look at the specs of the most anticipated sports car in a long time. Just expect some aspects to get lost in translation coming over the Pacific as a Scion FR-S.
Scion FR-S: This is it? The most anticipated statistic is weight, and this manual lists it as 1210kg (2662 pounds) for the base manual and 2706 pounds for the higher spec manual. An automatic adds 20kg in either trim level. Horsepower is listed as 147kw (200ps) / 200hp @7000rpm and torque as 205nm (151 lb/ft) @ 6600rpm. The engine is a 1998cc DOHC boxer 4 that drinks unleaded from a 50 liter (13.2 gallon) tank. Toyota is listing the fuel consumption as 12.8 kilometers/liter for the lower trim coupe and 12.4km/l for the top trim model. This should be somewhat different from what the EPA sticker will read in the states, different units of measurement aside. In terms of wheels and tires, the low spec model comes with 16s with a 205/55R16 tire and the top spec rides on 17s with a 215/45R17 tire. The suspension is struts up front and double wishbone in the rear. The FT86club forum spots that the top trim gets a limited slip differential on both manual and auto transmissions, while the lower spec model only gets LSD on manuals. Both trim levels get stability control and front passenger and front and rear curtain bags. The base car comes with halogen lights with optional HIDs, which are standard on the more expensive trim. The top trim level also gets LEDs up front, a leather steering wheel, 6 speakers (four more than the low spec), and white rev counter with shift light and sport pedals. The low spec only bets black dials. "Smart entry and start" also comes with the top trim. You can see what this will all look like in the scanned trim page. Toyota offers up a comparison chart for the FT-86 in both trims against an MX-5, an RX-8, and a CR-Z, but we'll have to drive one of these things to know if it really delivers on the sports car handling the world's car enthusiasts have been waiting for.